Werner's Cairns blog: Australia's lesser-known marsupial - the Bandicoot. Australia's lesser-known marsupial - the Bandicoot. Once upon a time sugarcane fires lit the Queensland (Australia) skies, throughout the cane-cutting season. The cane was burnt to remove the dry leaves to make cutting much easier, especially when the cane was still cut by hand. Today, this practice has been discontinued and mechanical harvesters have replaced the manual cane cutter. To watch a cane fire, was a great spectacle and a sight to behold, especially with the wind behind it, thirty-meter high flames were nothing unusual. Unfortunately, this spectacle had also a more ominous side to it. Many small animals, which found food and shelter in the cane fell victim to the fire, if they were not fast enough to escape. They were predominately snakes, rats and bandicoots. The latter is the subject I’m writing about. It is highly unlikely, I guess, that very many people outside Australia have heard about this marsupial, the cousin of our better known and national icon, the Kangaroo, and much less ever seen one. Seeing them of course is not easy, because they are nocturnal and start to come out from their hiding places at dusk in search of food. The diet of the Bandicoot is in the main, insects, grubs and worms, but they also eat some roots, fungi, and berries when in season. They move over the ground sniffling and snuffling as they go, and find insects by smelling them. They also have the ability to detect worms and grubs under the soil and quickly dig down with their narrow front feet. The front feet have three toes with long curving claws, so the holes they dig are narrow and pointed at the bottom, and the narrow snout fits neatly into the hole to get the worm or grub at the bottom of the hole. They live a solitary life, nest alone and spend the day hidden in a nest, hollow log or just under bushes. Photo: Bandicoot digging for food. The only time they tolerate the company of males is, when in season, solely to mate, after that event the male is no longer welcome. The lifespan of a bandicoot is only about three years. When females are about three months old they start breeding, and this will be a continuous process from then on, to the end of their days. They are still suckling their young in the pouch while the next litter grows in the womb. I can remember vividly, when I, for the first time encountered this small, but interesting little marsupial – mistakenly taking it for an over-sized rat. I was cutting sugarcane in Mossman in far North Queensland in the late 1950s, when we burnt off a paddock of sugarcane in the late afternoon, which was adjacent to a paddock that lay fallow. As the fire raged, a drama took place on the ground, as well as in the air. I exclaimed, “Oh my God, look at all those big rats escaping the fire!” My Boss said, “Those big ones are not rats, they are bandicoots”. “They are what? I asked again. This was my very first introduction to the word and the animal it represents. However, I have since then learned more about this animal as well as encountered them many times. Of course, for many bandicoots and rats that escaped the inferno into the fallow paddock, it was not the culmination of a lucky break. A lot of them fell prey to the many hawks that circled above and eager for a meal. The hawks literally had “a field day” with Gourmet food. I couldn’t help thinking of the old English proverb, in the reversed order, “from the fire into the frying pan”- it is indeed a cruel world out there! 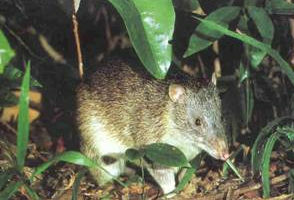 Bandicoot is the common name for any of 23 species of marsupials found in Australia, Papua New Guinea and Indonesia. 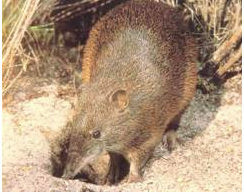 The Bandicoot ranges in length from 15 to 56 cm (6 to 22 in) depending on the species. They look like something between a rat and a rabbit. The colour of the fur ranges from grey, to brown and golden brown. I was told by cane farmers that the early European settlers called them “bandicoots” because they look like a pig-rat, or pandi-kokku of southern India, and the name has stuck. For members of the group which have long rabbit-like ears, we use the name the aboriginals gave them - bilby. As coastal cities are expanding and bushland is lost, bandicoots are squeezed out of their habitat. I was fortunate enough for many years to live, not “among the gumtrees” as the well-known Australian folk song goes, but among the bandicoots in North Queensland. They are generally considered useful little critters, especially in sugarcane where they dig for the very damaging cane grub. We lived for seven years at a place called White Rock, just south of Cairns. This area is now been fully developed and where once sugar cane grew are now houses, and it was renamed as "Mount Sheridan." We had mountains as a backdrop, and our house was adjacent to a little creek, bush and sugarcane; it was the ideal habitat of bandicoots. (Also, of many less desirable creatures). We had the pleasure of getting acquainted with one that came at dusk for a long time to the bottom of our steps, and the kids fed it with small bits of meat. This was very unusual, to come so close to humans, as they are normally very shy. We found of course, as intriguing as this little marsupial is, it also had a downside, if one lived in a country area. Wherever, there were bandicoots, there were always snakes around, as bandicoots are part of their food chain. But a more worrisome aspect was, they were carrying the deadly scrub tick, which dropped off their host onto the lawn after it had its fill of blood, from where it could get onto domestic animals such as dogs and cats, with dire consequences. It is said that bandicoots are immune to the tick poison. We lost two German shepherd dogs to tick paralysis, despite the vet administrating a very expensive antivenin, which was fairly new in the 1960s as well as extremely expensive, and the death resulting from tick poisoning was an agonizing one. At nighttime we always knew when bandicoots were paying us a visit; their squeaky grunts could be heard all night, and if males fought with each other, there were prolonged squeaky grunts. And, in the morning I would find to my chagrin, their instantly recognizable “visiting card” that they left behind - the numerous holes in the lawn, which could prove very annoying to any proud owner of a well-groomed lawn. Lets delve a bit deeper into the “inner workings” of this interesting little marsupial. Bandicoots have the shortest known pregnancy of any mammal – only twelve and a half days. The half-day has some significance; the female mates at night and the young are born in the daytime in the security of the nest. As with all marsupials, their young are very small and undeveloped, with no fur and unable to see, yet they are able to find their way into the pouch. In the case of the bandicoot, the young are only about one centimeter long. But, one of the most interesting aspects is: the pouch of the bandicoot opens backwards and inside the pouch are eight teats and they usually have three or four young. In comparison, the Kangaroo has only one young, two teats and the pouch opens upwards. Each newborn bandicoot attaches itself to one of the small teats in the pouch, which then swells, ensuring that the young stay there and don’t fall out of the pouch. Click image to enlarge. I pondered for long time, as to why the pouch would open backwards, and came to the following conclusion: the bandicoot digs holes with their shorter front legs in search of food, and if the pouch would open the other way, the pouch would be filled up with soil and smother the young. What do you think? I’m convinced beyond any doubt that the “designer” of the bandicoot, had certainly worn his thinking cap. To post a comment, read annotation below. I greatly enjoyed reading this fascinating and interesting story. Never knew about this marsupial. I’m a teacher and I’ll print it out for my students. Thank for sharing this story. Great story Werner. I remember as a child (we lived next door to bushland) we regularly had bandicoot visitors that would get into the scrap bin by the kitchen door. Because we left the back door open (you could in those days) they would come into the kitchen looking for food and we'd stand, ever so quietly, watching them. An early nature lesson!! We all know about big animals, but little or nothing about the small ones on our planet. I never ever knew about this little fascinating creature till I read this story. So, thank you, Werner, for sharing it with us mere mortals. Happy to hear you enjoyed my article "Bandicoots and Bureaucrats". It must be the time for sneaky little creatures and creepy bureaucrats to make their move this year. I have spent the last 30 years in the bush, but this was the first time I have seen a Bilby, which is a long eared bandicoot and the Australian replacement for the Easter Bunny! Yes and I saw it on Easter Friday 2012 at the front driveway of my property. Some say there are none around here (North Coast NSW) but neighbours have seen them this year as well. When I spotted it in the headlights, I said to myself "Oh, a wallaby? oh, a rabbit? Oh, what WAS THAT? Then I saw another one last month. It was a rare Bilby for sure.